"Dallas-Houston bullet train critics want to boost Texas oversight of eminent domain use" was first published by The Texas Tribune, a nonprofit, nonpartisan media organization that informs Texans — and engages with them — about public policy, politics, government and statewide issues. Cliff Waters couldn’t have been happier when a representative for the private company developing a high-speed rail line between Dallas and Houston offered to buy his Freestone County land. With power lines slicing his property in two, he had already been itching to get rid of the land before Texas Central Partners LLC approached him. But 100 miles away, Liz Machac has been adamant about holding on to her 235 acres of Grimes County property in the path of the proposed bullet train. Texas Central asserts that state law gives it the right to use eminent domain and force unwilling owners to sell their land, but Machac isn't so convinced. As legal battles and bureaucratic processes that could resolve such key disagreements play out, Texas Central is holding off from condemning anything — and Machac is holding on to her property. One of Leman's biggest concerns about the project is that even if Texas Central can use eminent domain, there is apparently no state agency explicitly charged with determining if its plans for high-speed rail would benefit the public enough to warrant condemnation proceedings in the courts. Back in the 1990s, the Texas High-Speed Rail Authority was a government entity tasked with determining if Texans wanted a high-speed rail system and awarding the right to build one to the most qualified private applicant, according to records from the Texas State Library and Archives Commission. The authority, which was created in 1989 by the 71st Texas Legislature, awarded the franchise to plan, finance, construct and operate a high-speed rail system to Texas TGV Consortium. But after Texas TGV failed to meet a financial deadline, and the authority began termination proceedings against it in 1994, lawmakers abolished the authority. During its short tenure, the authority had the power to exercise eminent domain and condemn property that was “in the public interest” on behalf of Texas TGV, according to the bill which authorized the authority. In a final report on the authority, former executive director Marc H. Burns underscored the need for state involvement in high-speed rail projects. Leman thinks such oversight is valuable. But he also worries his new legislative colleagues may not have an appetite for creating a similar agency again. That's because lawmakers in recent years have limited state involvement in Texas Central's project. The private company has vowed not to spend taxpayer money for the high-speed rail line, though it may apply for federal loans that it would repay. And lawmakers have forbidden the use of state funds to plan, build, maintain or promote the project. State Rep. Cecil Bell, Jr., the vice chair of the House Committee on Land and Resource Management, agreed that landowners in the path of the proposed project could benefit from increased state oversight. But the Magnolia Republican also admitted it could be “a double-edged sword” because new agencies create additional costs and bureaucracies. “It behooves us to either assign the task of structuring eminent domain by statute to an existing agency or consider placing that responsibility in the hands of a new agency,” Bell said. Constructing the line that could run America’s first bullet trains will cost between $15 billion and $18 billion, according to company estimates. Texas Central has already inked deals with construction and operations partners. Heavily backed by Japanese entities, it's gained access to more than $425 million in investments and loans as it keeps pushing forward with development. The company said it has secured purchase agreements from landowners on 30 percent of the parcels likely needed for the train’s route. But it has not said how many parcels it still needs. Trains could run at speeds of up to 205 miles per hour and cut a trip that would normally take four hours by car down to 90 minutes. Texas Central's president Tim Keith told the Tribune in February that trains could start running in 2024. The route was chosen after careful studies into the project's financial viability, impact on the environment and potential ridership numbers. Project supporters, especially those in the state's two largest urban areas, see it as a transformative project that could finally get Americans out of their cars and traveling between cities by rail. As more Texans flock to urban areas — and eschew car-centric lives in favor of other transportation modes — many see this as the right time to introduce a new way to travel. Meanwhile, the project has some federal oversight. As required by the National Environmental Policy Act of 1969, the Federal Railroad Administration began its environmental review process of the project and released a draft environmental impact statement last year. It was that review process that identified the likely path for the proposed project. The FRA is working on addressing the public comments it received and will publish a final environmental impact statement next year. Texas Central also filed a petition with the Surface Transportation Board, a federal agency that regulates railroads, asking it to assume federal jurisdiction over the project. Previously, the STB declined Texas Central’s 2016 petition. But the company filed another petition this year asking the STB to take jurisdiction over the project, this time because it has a “through ticketing agreement” that would allow Texas Central riders to connect with Amtrak’s rail network. The proposed Dallas station is about a 15-minute walk from an Amtrak station. The Houston bullet train station is miles from an Amtrak stop. The STB has yet to issue a decision on Texas Central's latest petition. But even if the STB assumes jurisdiction over the project, Texas Central will still need to prove that it has eminent domain power in Texas, according to Patrick McShan, an attorney for the group Texans Against High-Speed Rail. Leman, though, thinks there could be movement in the regulatory chess game facing Texas Central as he and others file bills next year that try to balance private property rights and economic enterprise. What would upcoming legislation look like? Well, Leman's playing that one close to the vest. But beyond the regulatory weeds of whether or not Texas Central has the power to take land — and whether a state agency should have oversight if it does — there remains a more fundamental divide between people like landowners Machac and Waters. For Machac, Texas Central is “pushy,” and the project solves a problem that doesn't exist. “It's not necessary, and we don't have the population density to support that,” Machac said. For Waters, the project represents progress and will go a long way toward removing much of the gridlock on Texas' highways. Disclosure: Texas Central has been a financial supporter of The Texas Tribune, a nonprofit, nonpartisan news organization that is funded in part by donations from members, foundations and corporate sponsors. Financial supporters play no role in the Tribune's journalism. Find a complete list of them here. Dallas-Houston bullet train critics want to boost Texas oversight of eminent domain use By Matt Zdun December 13, 2018 Cliff Waters couldn’t have been happier when a representative for the private company developing a high-speed rail line between Dallas and Houston offered to buy his Freestone County land. With power lines slicing his property in two, he had already been itching to get rid of the land before Texas Central Partners LLC approached him. “The people were very professional,” said Waters, who also owns land in Mexia and Galveston. “It was a good thing for me for sure.” But 100 miles away, Liz Machac has been adamant about holding on to her 235 acres of Grimes County property in the path of the proposed bullet train. Texas Central asserts that state law gives it the right to use eminent domain and force unwilling owners to sell their land, but Machac isn't so convinced. As legal battles and bureaucratic processes that could resolve such key disagreements play out, Texas Central is holding off from condemning anything — and Machac is holding on to her property. “My family was born and raised here, and it’s a special place,” Machac said. 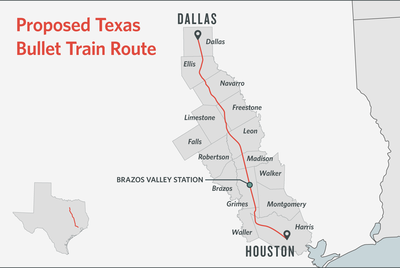 “There’s a historically designated cemetery on the land and just a lot of history in this area.” Central Texas Partners released this map showing the likely route of a high-speed rail line between Dallas and Houston. Graphic by Emily Albracht for The Texas Tribune Holly Reed, Texas Central’s managing director of external affairs, said the company prefers not to use eminent domain “at all” and would rather work out amicable sales agreements for the thousands of parcels needed to construct the 240-mile project across 10 counties. And the company vows to minimize how much the line will impact the land around it. “Each person has a different story about what’s important to them,” Reed said. “We listen to hear, you know, are we impacting your driveway or your stock tank, and we come back, and we work to see what we can do to solve for those problems.” Given the fierce opposition to the project in rural areas, eminent domain is likely to become a necessity at some point. Texas Central remains embroiled in the ongoing debate about its authority to condemn land. In one Harris County case, a judge agreed the company has such powers. But that same legal question is at the heart of other ongoing court cases across Texas. Meanwhile, a newly elected lawmaker who has long opposed the project plans to file legislation that addresses what he calls “systemic flaws” in state statutes that arguably allow the company to condemn the land it will need. “It’s nothing more than you and I sitting in a room with a couple hundred million dollars and saying, ‘We’re a railroad company, and we’re going to condemn your property,’” said state Rep. Ben Leman, R-Anderson. “And then the landowner is sitting there scratching his head and saying, ‘Who do I turn to?’” One of Leman's biggest concerns about the project is that even if Texas Central can use eminent domain, there is apparently no state agency explicitly charged with determining if its plans for high-speed rail would benefit the public enough to warrant condemnation proceedings in the courts. But once upon a time, there was. A forgotten agency Back in the 1990s, the Texas High-Speed Rail Authority was a government entity tasked with determining if Texans wanted a high-speed rail system and awarding the right to build one to the most qualified private applicant, according to records from the Texas State Library and Archives Commission. The authority, which was created in 1989 by the 71st Texas Legislature, awarded the franchise to plan, finance, construct and operate a high-speed rail system to Texas TGV Consortium. But after Texas TGV failed to meet a financial deadline, and the authority began termination proceedings against it in 1994, lawmakers abolished the authority. During its short tenure, the authority had the power to exercise eminent domain and condemn property that was “in the public interest” on behalf of Texas TGV, according to the bill which authorized the authority. In a final report on the authority, former executive director Marc H. Burns underscored the need for state involvement in high-speed rail projects. “The State should retain planning and oversight roles in all new transportation infrastructure, particularly where new right-of-way may be required,” Burns wrote in the report. “[High-speed rail] is a mass transportation project and the role and power of safeguarding the public must be reserved to the State. Only after we have articulated how the project may be accomplished without denigrating the lives of Texans can we seek a private partner to implement a plan designed to better Texas.” Leman thinks such oversight is valuable. But he also worries his new legislative colleagues may not have an appetite for creating a similar agency again. That's because lawmakers in recent years have limited state involvement in Texas Central's project. The private company has vowed not to spend taxpayer money for the high-speed rail line, though it may apply for federal loans that it would repay. And lawmakers have forbidden the use of state funds to plan, build, maintain or promote the project. State Rep. Cecil Bell, Jr., the vice chair of the House Committee on Land and Resource Management, agreed that landowners in the path of the proposed project could benefit from increased state oversight. But the Magnolia Republican also admitted it could be “a double-edged sword” because new agencies create additional costs and bureaucracies. “It behooves us to either assign the task of structuring eminent domain by statute to an existing agency or consider placing that responsibility in the hands of a new agency,” Bell said. New attitudes and federal oversight Constructing the line that could run America’s first bullet trains will cost between $15 billion and $18 billion, according to company estimates. Texas Central has already inked deals with construction and operations partners. Heavily backed by Japanese entities, it's gained access to more than $425 million in investments and loans as it keeps pushing forward with development. The company said it has secured purchase agreements from landowners on 30 percent of the parcels likely needed for the train’s route. But it has not said how many parcels it still needs. A high-speed Texas train is planned to run near railroad tracks along Hempstead Road in northwest Houston. Brandon Formby Trains could run at speeds of up to 205 miles per hour and cut a trip that would normally take four hours by car down to 90 minutes. Texas Central's president Tim Keith told the Tribune in February that trains could start running in 2024. The route was chosen after careful studies into the project's financial viability, impact on the environment and potential ridership numbers. Project supporters, especially those in the state's two largest urban areas, see it as a transformative project that could finally get Americans out of their cars and traveling between cities by rail. As more Texans flock to urban areas — and eschew car-centric lives in favor of other transportation modes — many see this as the right time to introduce a new way to travel. And Reed, the Texas Central executive, said her company learned from the failure of the previous high-speed rail attempt and has developed “a better approach for Texas that will work.” “When you have a project that is not government-driven, you have the discipline of following the data,” Reed said. “This project works because it's in the sweet spot of the too far to drive, too short to fly. It's got a strong market.” Meanwhile, the project has some federal oversight. As required by the National Environmental Policy Act of 1969, the Federal Railroad Administration began its environmental review process of the project and released a draft environmental impact statement last year. It was that review process that identified the likely path for the proposed project. The FRA is working on addressing the public comments it received and will publish a final environmental impact statement next year. Texas Central also filed a petition with the Surface Transportation Board, a federal agency that regulates railroads, asking it to assume federal jurisdiction over the project. Previously, the STB declined Texas Central’s 2016 petition. But the company filed another petition this year asking the STB to take jurisdiction over the project, this time because it has a “through ticketing agreement” that would allow Texas Central riders to connect with Amtrak’s rail network. The proposed Dallas station is about a 15-minute walk from an Amtrak station. The Houston bullet train station is miles from an Amtrak stop. The STB has yet to issue a decision on Texas Central's latest petition. “Every other major railroad, passenger and freight, is regulated by the STB,” said Reed. 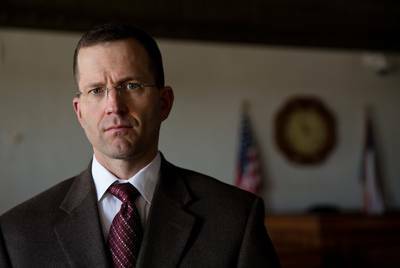 “So it puts this project on a level playing field with those other major railroads.” But even if the STB assumes jurisdiction over the project, Texas Central will still need to prove that it has eminent domain power in Texas, according to Patrick McShan, an attorney for the group Texans Against High-Speed Rail. “The Surface Transportation Board can’t grant eminent domain,” McShan said. 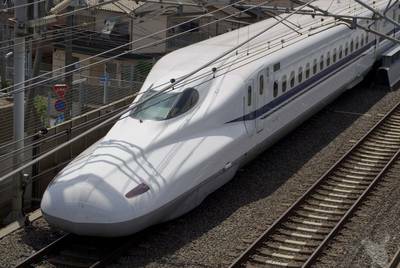 “They can’t get Texas Central over that hurdle.” The Japanese Shinkansen is a high-speed train used by Central Japan Railway Company in Japan. 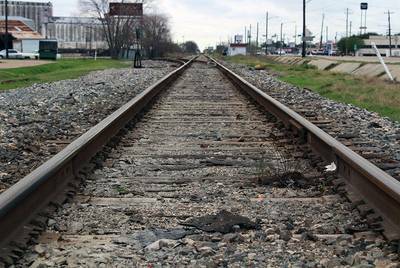 Texas Central plans to build a rail line between Dallas and Houston using the same trains. Norihiro Kataoka Hurdles remain Kyle Workman, the chairman and president of Texans Against High-Speed Rail, said the company will still face intense battles at the county level. “At every one of those intersections where the railroad crosses a county road, there is going to be a permit that is required,” Workman said. “They’re going to have to prove that they have eminent domain, and the counties are not going to allow them to take the property.” Reed said that Texas Central would like to work “collaboratively” with the counties in order to get the project built and become a “major economic engine” for Texas. Meanwhile, lawmakers will return to Austin for a new legislative session that begins in January. And Leman expects Texas Central to be the target of legislation. In 2017, 10 lawmakers filed more than 20 bills aimed at the high-speed rail line. But for the second legislative session in a row, the project emerged relatively unscathed after bills aimed at hamstringing or killing it failed to get much traction. Leman, though, thinks there could be movement in the regulatory chess game facing Texas Central as he and others file bills next year that try to balance private property rights and economic enterprise. What would upcoming legislation look like? Well, Leman's playing that one close to the vest. State Rep. Ben Leman, who has long opposed the Texas bullet train, says he'll file legislation targeting the project. Callie Richmond for The Texas Tribune “This should be a big session to discuss this project,” Leman said. “But I don’t want to tip my hand too quick because they are not giving me their hand.” Pushy or progressive? But beyond the regulatory weeds of whether or not Texas Central has the power to take land — and whether a state agency should have oversight if it does — there remains a more fundamental divide between people like landowners Machac and Waters. For Machac, Texas Central is “pushy,” and the project solves a problem that doesn't exist. “It's not necessary, and we don't have the population density to support that,” Machac said. For Waters, the project represents progress and will go a long way toward removing much of the gridlock on Texas' highways. “People never agree to progress,” Waters said. "They always want to live in the past. They’ve inherited [land], and they don’t like people changing their property, and I understand that. But it’s something that needs to happen.” Disclosure: Texas Central has been a financial supporter of The Texas Tribune, a nonprofit, nonpartisan news organization that is funded in part by donations from members, foundations and corporate sponsors. Financial supporters play no role in the Tribune's journalism. Find a complete list of them here. Read related Tribune coverage Kim Olson talks Ag Commissioner Sid Miller, eminent domain and internet access in rural Texas The Taking: How the federal government abused its power to seize property for a border fence Border wall plans spur effort to help Texas landowners with eminent domain "Dallas-Houston bullet train critics want to boost Texas oversight of eminent domain use" was first published at by The Texas Tribune, a nonprofit, nonpartisan media organization that informs Texans — and engages with them — about public policy, politics, government and statewide issues. Link back to the original article, which is located at https://www.texastribune.org/2018/12/13/dallas-houston-bullet-train-critics-want-texas-oversee-eminent-domain/.